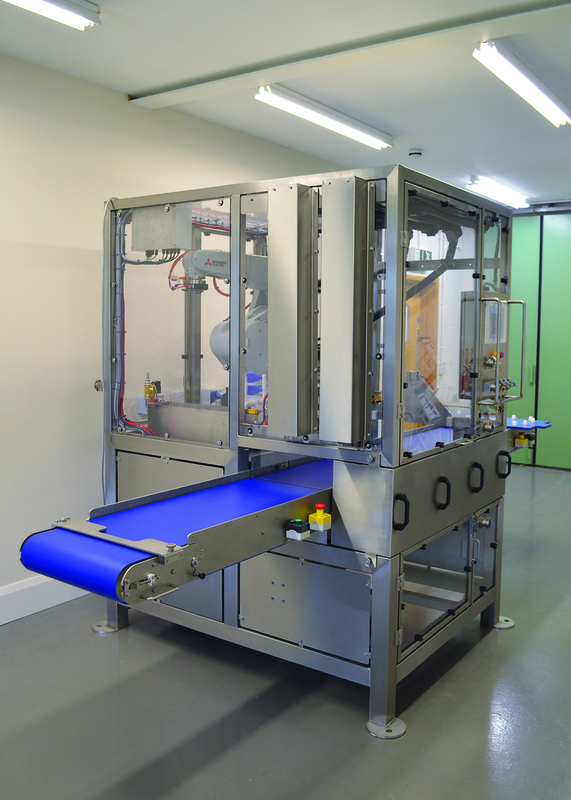 Newtech is a specialist supplier of standard machines which provide food manufacturers with cost-effective, quality automation systems, with high levels of flexibility to meet ever-changing market demands. One of the company's innovations is the adoption of ultrasonic cutting technology, giving best-available cut quality for products which are difficult to process using conventional methods. Cakes, in particular, are notoriously difficult to cut reliably: machines tend to be time consuming to set up for different cake sizes, depths and portion numbers, whilst traditional cutting technologies can result in uneven, messy cuts and unacceptable levels of damaged product. With a new machine design, Newtech set out to overcome these limitations by combining ultrasonic cutting with robotic actuation of the cutting blade. 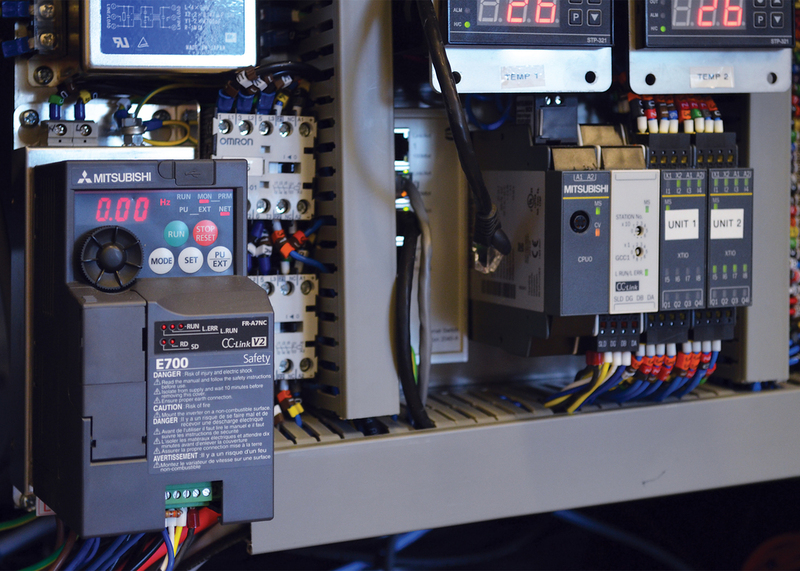 For an out-of-the-box solution which would be easy to integrate into the machine, Newtech turned to Mitsubishi Electric. The solution offered by Mitsubishi Electric was built around an RF13 13kg payload, six axis robot, mounted within a stainless steel cell. One of the fastest robots in its class, the RF13 is also highly dextrous, being capable of reaching all the way behind itself and also very close to its base, giving a highly flexible and compact working area. 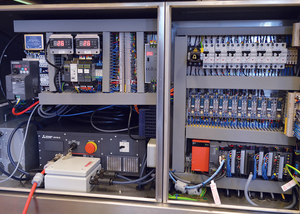 The robot is controlled via the Mitsubishi Electric iQ Platform. 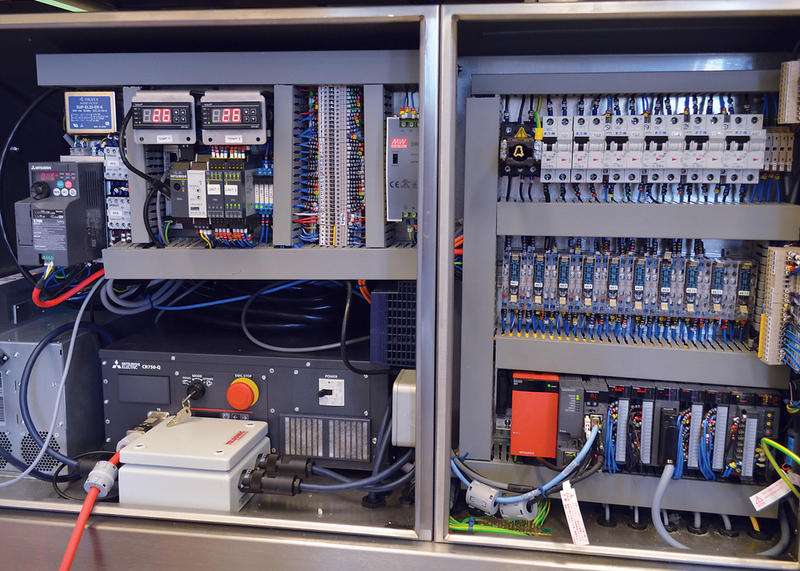 The iQ Platform is a multi-functional automation environment which incorporates Q series PLC control and uniquely, an integrated robot controller within the same rack. This removes the need for a network connection to a traditional external robot controller, which means that communication exchange between the PLC CPU and the robot controller is handled across the rack, increasing speed, data throughput and reducing robot setup times. A CC-Link network is used to connect other machine control components such as a Mitsubishi Electric inverter drive and a dedicated Mitsubishi Electric WS safety controller providing a totally integrated machine control solution. A Mitsubishi Electric GOT2000 HMI provides a user interface where operators can select different cake recipes and set parameters such as product height, portion size, total number of portions and trim size. The GOT HMI also acts as a teach pendant for the robot via dedicated screen templates within the HMI. The ability to deliver this versatile product portfolio, ex stock, as an easy to integrate out-of-box solution means that machine builders of any size and capability have it within their grasp to integrate robotic solutions, quickly and easily. 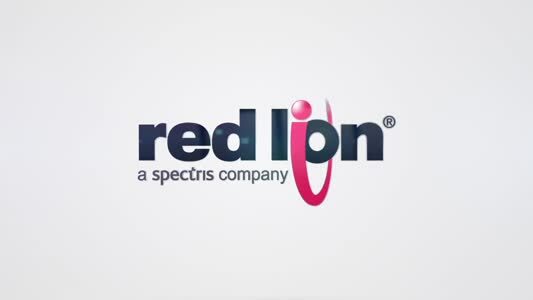 All products are programmed and configured using the iQ Works integrated engineering environment, which speeds up design and development, reduces commissioning times and eliminates "double entry" of tag data via its common database. 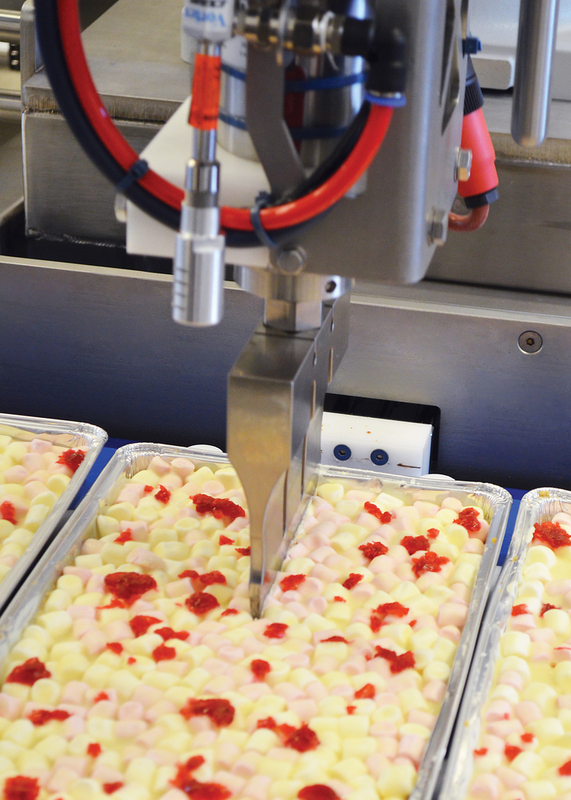 The result of the robot integration is the newest model in Newtech's robo range of machines, delivering the ultimate in flexibility for cake portioning within the bakery industry. The in-line format machine provides a compact, multi-product platform. The high-speed ultrasonic blade offers precision, clean cutting as standard, even on the most detailed of cake products. In operation, a through-conveyor indexes product in and out of the machine, from left to right. Product is fed into the machine in standard size bakery industry aluminium trays – with the machine accommodating bakery tray sizes of 30"x18" or 30"x16". A series of inductive sensors identify the tray size and ensure that it is in the right position in the machine cell, whereupon the tray is fixed and held in a precise position by a series of clamps. This accurate positioning is important to ensure that the ultrasonic blade does not contact with the tray edges. Once the tray is in position, the robot actuates the ultrasonic blade to portion the product based on the parameters entered on the HMI. During the cutting process, another tray can be loaded onto the conveyor, and once the cutting cycle is complete the next tray is indexed into the cell. As well as the standard size bakery trays, the machine is also capable of cutting products in smaller foil trays. For this mode, the foils are placed in a row of three on a nested product board. The same clamp arrangement is used for accurate positioning. 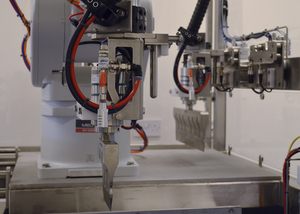 The robot automatically selects a smaller blade – purposely profiled to fit within the shape of the foil tray – via an automatic head change unit. An innovative feature of the machine is a cleaning tank to wash the ultrasonic blade. During the cleaning cycle, the robot takes the relevant blade to the cleaning tank, and a series of water jets spray both sides of the blade. The blade is then dried as the robot passes it through an air blast. 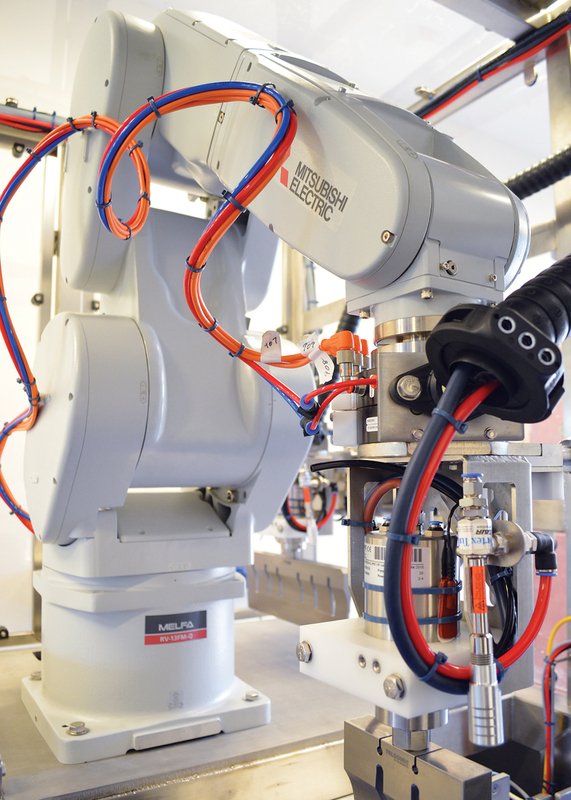 "Working with Mitsubishi Electric for the robot integration made the whole process easy," comments Newtech managing director Steve Rawlinson. 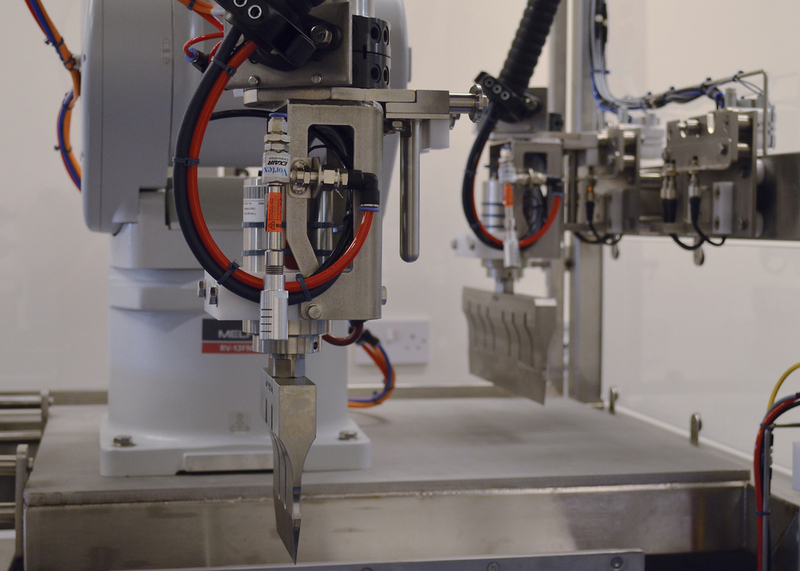 "The high capability robot, combined with a full automation product offering all with the same software package, made it simple to integrate the robot into the machine. This enabled us to take advantage of ultrasonics for precise, neat, damage-free cake cutting." Another benefit of the RF13 articulated robot in this application was its smooth sleek design, as Rawlinson explains: "It is a very clean robot, with smooth faces and very few gaps where waste product can accumulate - that's a real benefit in a food processing and manufacturing environment."